Hamilton welcomes back Jesse Stewart! Local jazz fans are still talking about the Ottawa-based drummer’s last appearance here in 2016, when he wowed the audience at the Art Gallery of Hamilton with his collective trio Sonoluminescence, with David Mott baritone saxophone and William Parker bass. This year, Jesse Stewart is the Something Else! Festival Artist in Residence, so Hamilton gets to spend five days with this award-winning composer, percussionist, visual artist, sound artist, instrument builder, researcher, writer, and educator. 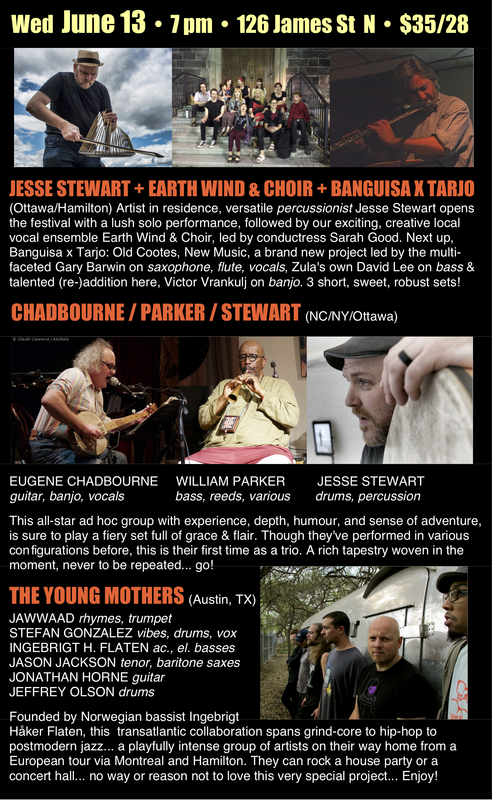 As well as his commitment to fostering community health through music, art, and education, Jesse has collaborated in performance and recordings with such giants of contemporary music as Pauline Oliveros, Evan Parker, Hamid Drake, Roswell Rudd, Jane Bunnett, and Pandit Anindo Chatterjee. Opening the festival with a solo percussion performance, and closing it with a concert by his Juno Award-winning Stretch Orchestra, in between Jesse performs with visiting and local players alike, including Michael Snow, Joe McPhee, Heather Cornell, and Eugene Chadbourne, as well as making a return appearance with Sonoluminescence. This local vocal institution is a fun, adventurous, weirdo-singing group made up of dedicated and creative individuals. Conductress Sarah Good plays the choir of 15-20 vocalists like an instrument. The ever-evolving group began nine years ago and has focused on performing the most beautiful/ugly and interesting music it can find. Their repertoire includes pieces from the first era of polyphony, shape-note singing, avant-garde pop, through to the 20th century minimalists. Taking a page from Bill Frisell’s creative reworkings of popular tunes, this trio deconstructs traditional songs from the Anglo-Irish and world music canon and teleports them into new and unexpected forms. With a name like this, the band could only be the brainchild of Gary Barwin, Cootes Paradise frequenter, composer, saxophonist, sound artist, and poet whose novel Yiddish for Pirates became a bestseller and netted him the Leacock Medal for Humour. With Barwin is Victor Vrankulj, a banjoist and double bassist who’s studied at Mohawk College and the University of Toronto, and is known to Hamilton audiences through his own quartet, and the Belwether Quartet from the Something Else! series. Completing the trio is David Lee, a veteran improvising double bassist and cellist who has played with Joe McPhee, Leo Smith, Roscoe Mitchell, and the Bill Smith Ensemble, and is best known to Something Else! audiences for the dynamic Lee-Palmer-Bennett Trio. An inspired matching of Eugene Chadbourne (guitar, banjo), William Parker (double bass) and Jesse Stewart (percussion), that could only happen at Something Else! Chadbourne is known for his early collaborations with John Zorn, Fred Frith and Henry Kaiser, his work with Shockabilly, and his vast catalogue of records involving everyone from Camper Van Beethoven to Jimmy Carl Black. Chadbourne is an avant-gardist who digs into the history of American traditional and popular music, and filters it through the artistic impulses of free jazz. Parker is simply one of the most important bass players working today. While his roots go back to his work with Cecil Taylor in the 1980s, Parker is a creative force who works internationally with the most important improvisational musicians of our time, including Matthew Shipp, David S. Ware and Ken Vandermark. Propelling this unit is artist-in-residence Jesse Stewart, the Ottawa-based musician, teacher and visual artist who is quickly becoming one of the central figures in the international contemporary improvised music community. The Young Mothers are the brainchild of the Norwegian-born bassist Ingebrigt Håker Flaten (familiar to Hamilton listeners from his Something Else! concerts with The Thing, Rempis Percussion Quartet and Atomic), now based in Austin, Texas, got together with Houston trumpeter/rapper Jawwaad Taylor to form a group notable not only for its free improvisation, but for Tejano-inspired horn lines, the long unfurling electricity of surf rock, tough word-science and crust metal vocals. A juggernaut of an improvising collective formed in 2012 in Austin Texas, featuring a half-dozen musical heavy-hitters from New York, Chicago, Texas, and Scandinavia. The group’s debut album A Mothers Work is Never Done (Tektite Records, 2014) has been described as a creative-music pacesetter with its jack-out-of-the-box surprises ranging from grindcore injections to visionary hip-hop to spirited and moody takes on modern jazz and improv.